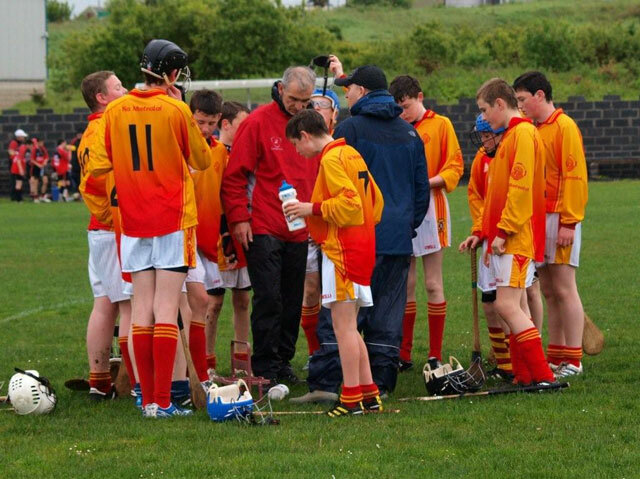 Photo from last Saturday's (21 May 2011) U14 championship match between Castlebar and Ballyhaunis 'Castlebar Team Talk' photo by Mary Murray. U8 and U10 Training on Wednesdays at 6pm. All are welcome and well done to all our players who took part in a recent blitz in Claremorris where both teams went unbeaten throughout the Blitz. U12 continue training on Wednesday at 6pm and most of these lads are also playing on the u13 team. U13 and U14 teams are currently starting the respective championship, well done to the U14 team who beat Ballyhaunis 9 - 3 to 1 - 1 and the highlight was the performance of our full forward Ciarain Fahey who scored 7 goals surely a record for a hurling match well done Ciarain and the team. U16 are currently finishing their league and with a very young are finding the going tough at the moment but with all their players back for the championship should be a different team. U18 team are now taking a break with the junior and leaving cert imminent good luck to all our players sitting exams at this time. Both A and B teams are in a good position in the championship. U21 Championship not due to start till July. Junior Team have finished their league and missed qualifying for the final on scoring difference. Championship start end of July. Senior Team start the championship Friday night next with a trip to Ballyhaunis to play the County Champions what a game to start with, with all the training that has taken place Castlebar will be travelling with a good level of confidence and hope that they will be able to compete with the finest hurling team seen in Mayo for quite a long time. Game throws in at 7.30 pm in Ballyhaunis. Off the field our lotto continues with next draw due to take place in Johnny McHales in a couple of weeks time. Hurling on the Green will then follow starting on the 4th July and running for 6 weeks so for the next 11 weeks hurling will be coached on a daily basis somewhere in Castlebar. All the above costs money and with the recession hitting deeply our club is no different from any other and are finding it tough going at the moment and especially with all the equipment needed, if there is anybody out there willing to help whether it be buying a dozen sliothars or hurleys or joining as a member buying a lotto ticket or a county board ticket your support would be hugely appreciated.